1 You foolish Galatians! Who has bewitched you? Before your very eyes Jesus Christ was clearly portrayed as crucified. 2 I would like to learn just one thing from you: Did you receive the Spirit by the works of the law, or by believing what you heard? 3 Are you so foolish? After beginning by means of the Spirit, are you now trying to finish by means of the flesh? 4 Have you experienced so much in vain―if it really was in vain? 5 So again I ask, does God give you his Spirit and work miracles among you by the works of the law, or by your believing what you heard? (Genesis 15:1-6) After this, the word of the Lord came to Abram in a vision: “Do not be afraid, Abram. I am your shield, your very great reward.” 2 But Abram said, “Sovereign Lord, what can you give me since I remain childless and the one who will inherit my estate is Eliezer of Damascus?” 3 And Abram said, “You have given me no children; so a servant in my household will be my heir.” 4 Then the word of the Lord came to him: “This man will not be your heir, but a son who is your own flesh and blood will be your heir.” 5 He took him outside and said, “Look up at the sky and count the stars―if indeed you can count them.” Then he said to him, “So shall your offspring be.” 6 Abram believed the Lord, and he credited it to him as righteousness. 7 Understand, then, that those who have faith are children of Abraham. 8 Scripture foresaw that God would justify the Gentiles by faith, and announced the gospel in advance to Abraham: “All nations will be blessed through you.” 9 So those who rely on faith are blessed along with Abraham, the man of faith. 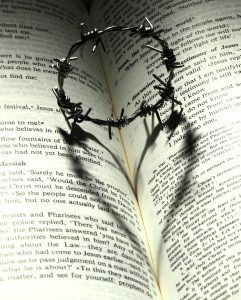 13 Christ redeemed us from the curse of the law by becoming a curse for us, for it is written: “Cursed is everyone who is hung on a pole.” 14 He redeemed us in order that the blessing given to Abraham might come to the Gentiles through Christ Jesus, so that by faith we might receive the promise of the Spirit. Paul’s interpretation of the Bible was totally changed through the facts of Jesus’ death and the pouring of the Holy Spirit. It can be said it was his re-interpretation of the word of God. Let us also be able to interpret the Bible freely and rightly, by knowing that our faith is a blessing given by God instead of something we could earn by our own works. 1) What is Abraham’s faith, that we should learn from? 2) What does it mean to interpret the Bible?